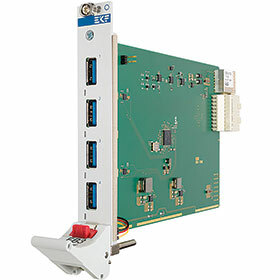 EKF has introduced the EB3-Tone, a peripheral slot board for CompactPCI Express and PXI Express systems, equipped with a quad port USB 3.0 host controller requirement. All four USB connectors are available from the front panel for attachment of external USB devices. • PCIe x1 upstream – Gen2 (5,0 Gbps). • PCI Express x1 Gen2 interface. • USB 3.0 xHCI (eXtensible host controller interface) SuperSpeed supported. • USB 2.0 high-speed, full-speed and low-speed all supported. Simple path to Industry 4.0-enabled process technology using an IoT edge device. Ultra-compact industrial PCs: a new generation of devices for challenging automation, visualisation and communication tasks. C6030 Industrial PC expands ultra-compact series with maximum processing power and up to 3.6 GHz per core. 4G LTE-enabled wide-temperature industrial computers.